This has got to be one of my top three lazy dishes. This is also a dish Chinese women who’ve given birth eat, because it has loads of ginger. Takes only minutes to make and uses only six ingredients! Toss in about three to four tbsp of oyster sauce, and mix. Lower to medium heat, cover and simmer for about 20 mins, stirring occasionally until chicken is cooked. Serve piping hot with rice! Cooking for a family means having to cook nutritiously, and while we don’t need to be counting the calories for the kids, my husband and I do consider the calories when it comes to our food. So the next time you prepare something, make sure you look before you cook, and to help you keep track of all the calories you’re taking in, check out My Fitness Pal’s free calorie counter that allows you to do calorie counting simply by keying in the numbers and making a few clicks. My Fitness Pal’s calorie counter is fast and easy to use, helping you to learn the nutritional contents of what you are eating, and consequently, how you can make better food choices. Furthermore, the site is 100% free – no credit card is ever required. Lose weight and keep fit the healthy way, with MFP’s calorie counter! As you have probably noticed, I haven’t updated this blog in a while (since Christmas, looking at the last post which is of Xmas sugar cookies!). Which means I haven’t experimented in a long time. Don’t be disheartened. I will update this, sooner than you expect. Hi all, sorry for the long hiatus. Been moving house, flooding, snowed in – I have all the excuses! 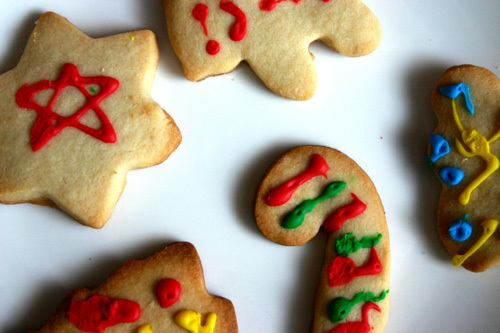 Anyway, to herald in the holiday season, here’s a recipe for simple sugar cookies. They keep their shape quite well, although for one batch, I added just a half stick more butter and they didn’t, so mind the butter if you want the shapes to stay. You will need a power mixer for this and cookie cutters for shapes. 1 tsp baking powder. In lieu, you mix together 1 tsp of cream of tartar powder, 1/2 tsp baking soda and 1 tbsp corn flour to make your own baking powder. In a bowl, mix together the flour and baking soda and powder. In your separate mixer bowl, cream sugar and butter until, well, creamed. Break in egg, mix a little more, and then pour in the flour from first bowl slowly. Mix until doughy. On a floured surface, knead and roll dough into golf ball sizes, and flatten with hand. Make sure everything is floured so dough won’t stick. Flour your cutters before applying as well so dough will pop out nicely. Put on ungreased baking sheet and bake for eight to ten minutes, until brown at the sides. Mix well together. Once combined, separate into batches if intend to colour. My mother-in-law taught me to make this, and it’s surprisingly easy to make. She got it from some Hong Kong cooking show. Pork ribs are definitely a favourite among meat-eaters so you won’t go wrong with this one. Not recommended if you’re on a diet! Best served with steaming white rice. This is perhaps one of the first dishes my mother taught me, which was the only dish I knew how to make perfectly for a very long time. My husband joked that he would eat nothing but that as soon as we got married. This is a simple dish requiring less than ten ingredients to make. It is also a good one to serve at dinner parties, if one is serving Asian. What’s more, it is low fat and filling (if not taken with rice), ideal for those watching their waist lines! dried Chinese black mushrooms, about four cups: pre-soak in water (just enough to cover the mushrooms, not too much as we need to use the water). Remember to remove the stems. two tbsps of sugar. In Malaysia, we use ‘ping tong’, which are sugar crystals. If you’re using ‘ping tong’, about one big rock, and one small. If you like it sweeter, then adjust accordingly. Brown sugar also works. Fry garlic in two-three tbsps of cooking oil for 30 seconds. Make sure wok or skillet is on high heat. Slip in drumsticks and cook for one to two minutes. Pour in minimum 2-3 tbsps of oyster sauce, or more according to your taste, and mix. Cover and simmer at medium heat for 15 minutes, and then to low for another 15-20 minutes. Serve with steamed rice for best results! Thanks to a friend of mine, I’ve learnt the delicious things one can do with Balsamic Vinaigrette! Brush one tortilla on one surface with the vinaigrette. Spread the basil leaves first, then tomatoes and then sprinkle cheese gratings on top. Fold into half and set oven to 400F. Toast for 8-10 mins. Makes a great lunch or dinner! Since I’m on a diet these days, I’ve had to find types of food I like to eat, which are also not a pain to make. Vietnamese Rice Paper Rolls are one. To soften the rice paper, instead of soaking the paper in hot water, my friend Hazel advised to brush it on instead with a basting brush. It works better, as the paper isn’t too soft to maneuvoure. Recipe for the sauce is below, under my Vietnamese Beef Noodles post. This will actually be the most difficult dish Cooking Monster has seen thus far, but don’t be afraid, it’s not TOO difficult. One of my favourite meals, Vietnamese Beef Noodles (or Pho) is a delicious, soupy meal that beef lovers will definitely enjoy. Although Vietnamese restaurants are widespread here in the US, most do not give a lot of meat or if you DO ask for more, it will most definitely cost you. And since my husband and I are meat lovers, I decided to attempt a recipe I found at Recipezaar. There are simpler ones out there (using beef broth) but I wanted it to be authentic. Now for this recipe, if you like a spicier taste (by that I don’t mean hotter, but more aromatic) you might want to increase the portions of spices indicated (the ones you wrap in the cheese cloth). I found the end result, following this recipe, to be milder than we like it to be. One important point I’d like to add to the recipe is that you can cook the soup overnight using a slow cooker, which saves a lot of time ‘looking after’ the boil. Broiling the onion and ginger may also be skipped if you prefer them to go stronger in your soup. You may also want to add tripe to the ingredients, which isn’t in the recipe here. Also, I would recommend adding more beef bones or beef bouillon to ‘thicken’ the soup. Instead of fillet mignon, I used the flank part, which turned out well, was really tender. Just mix together and eat with noodles instead of Sriracha sauce. Hi all. It’s been a while since I’ve posted anything here. Which means I haven’t really been experimenting a lot. Until yesterday, that is! This dish is relatively easy to make. We’ve been eating so much chicken these days that I found a large stash of pork loins in the freezer, so I decided to make something different for the family. This recipe is originally from recipezaar.com, one of my favourite cooking sites. However, I would advise using less salt than recommended, and NOT to season your pork for browning. The cheddar cheese soup is already quite salty as it is. Also, be sure to mix the flour well and perhaps add a little water. Also make sure to stir your dish in the oven at half time. I found a large clump of uncooked flour at the bottom of the dish, which is unsavoury-looking, to say the least. Since becoming a full-time mom December 2005, I've had to learn to cook. Where I come from, not many new mommies appreciate the joys of cooking, so this blog is dedicated to ALL of us who've NEVER wanted to go into the kitchen until we've absolutely had to! The Cooking Monster is yet another blog by Jennifer Tai, aka The I'mPerfect Mom. Georgianne Graphic T… on Look before you cook!